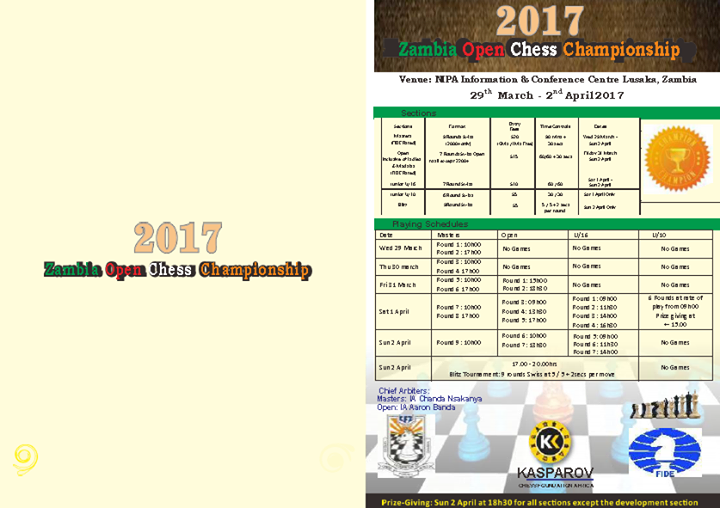 A reminder that the 2017 Zambia Open will take place in Lusaka from Wednesday 29th March - Sunday 2 April 2017. 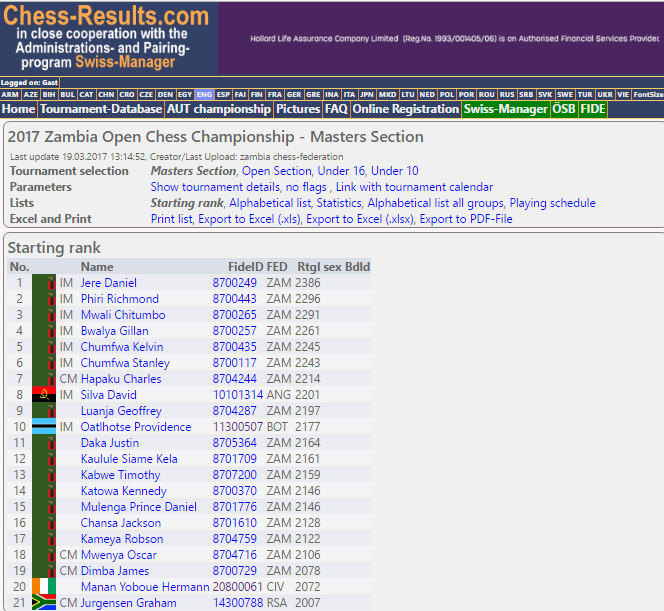 The Masters section of the tournament has already attracted more than 20 players rated 2000+ and will likely offer an IM norm to any player who records a tournament performance of 2450+. 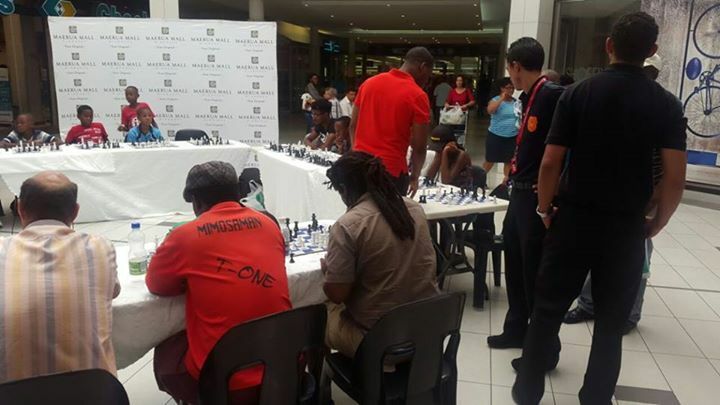 Players from South Africa, Cote d'Ivoire, Nigeria, Angola, and Botswana have already registered while Zimbabwe is also expected to send a strong contingent to participate. 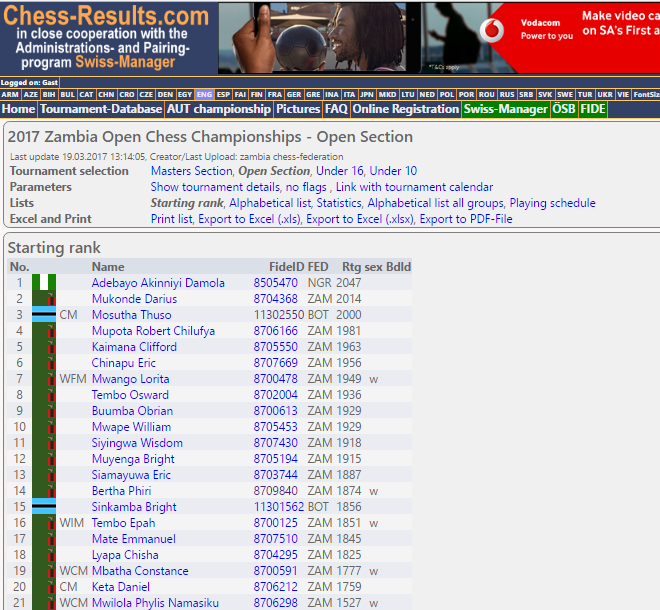 The open section is also expected to be very strong and already features 6 titled players including most of the top female players from Zambia. All valid registrations will be published on chess-results at http://chess-results.com/tnr266544.aspx?lan=1&art=0&turdet=YES&flag=30&w... within 2 working days of being received. 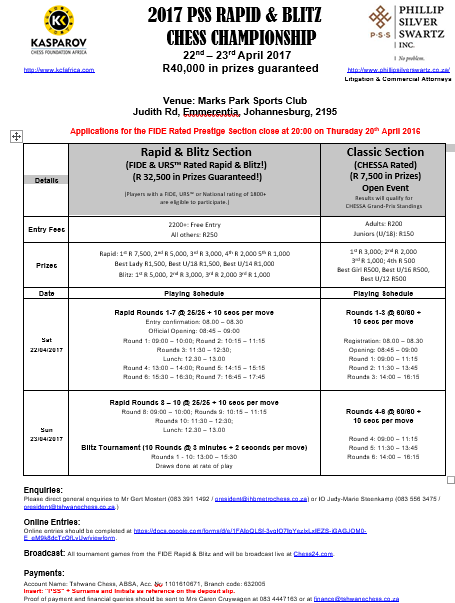 The final tournament brochure is available for download at http://www.kcfafrica.com/en/content/forthcoming-events-0 for anyone looking for copies. 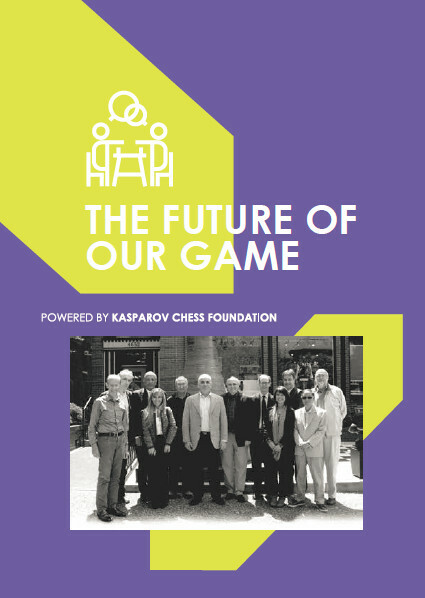 KCF is pleased to be able to announce that GM Farrukh Amonatov (2632) from Tajikistan and GM Sriram Jha (2396) from India will both be participating in the forthcoming PSS Rapid and PSS Capablanca tournaments in South Africa in April. 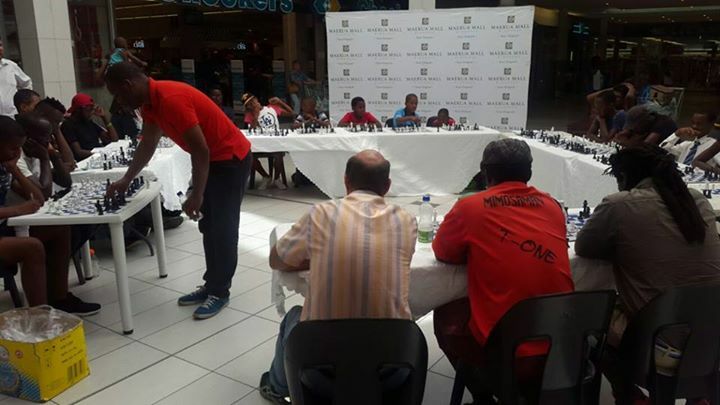 They will be joined by most of the top players in Southern Africa in a 10 player field that will have a 2350 average rating and a norm requirement of 6/9 for local norm seekers. We would like to ask all players who intend to play in the various events to register and pay as early as possible to assist the respective organizers with the logistical arrangements for the tournaments. 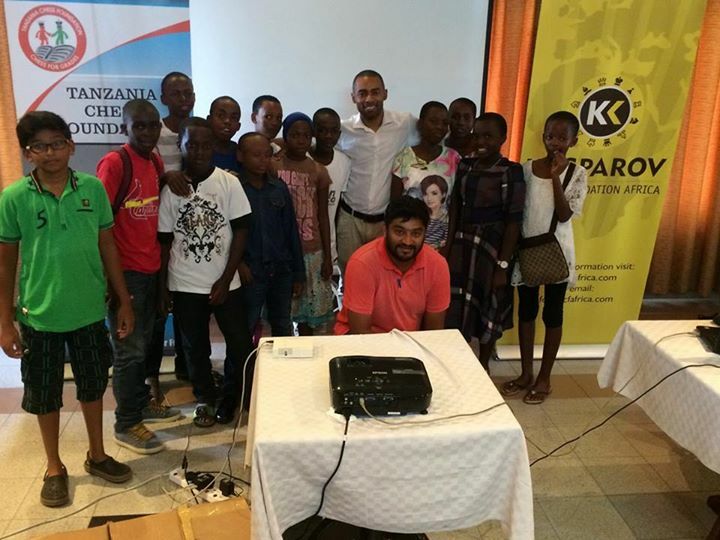 GM Kenny Solomon completed the 3rd and final leg of his African Tour in Dar es Salaam where he was hosted by CM Nurdin Hassuji and the Tanzanian Chess Foundation. 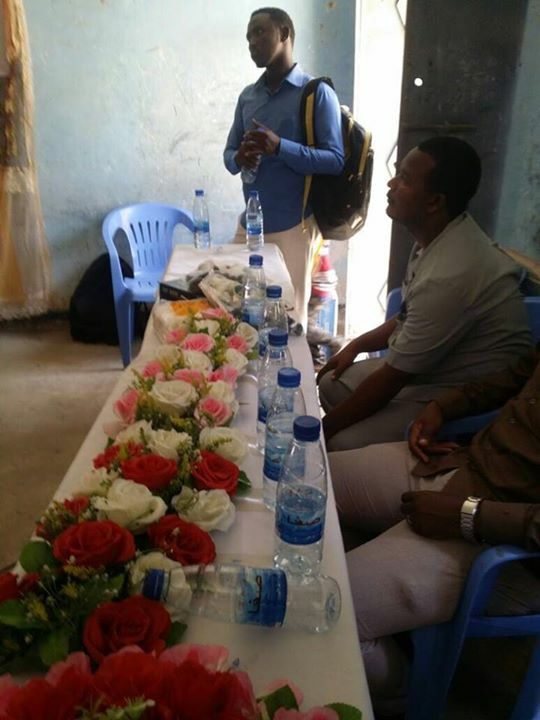 We wish to thank Nurdin for the below report from Tanzania which served as a fitting finale to a highly successful East African tour. 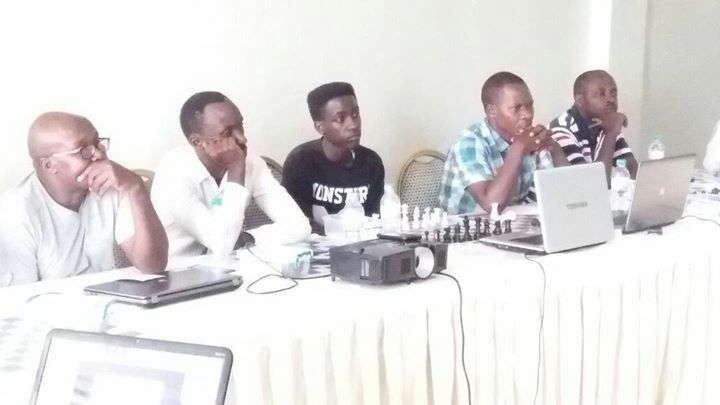 GM Kenny Solomon arrived on 23rd February 2017 from Kigali in Rwanda for the 3rd and final leg of his Chess Masters for Africa Tour. 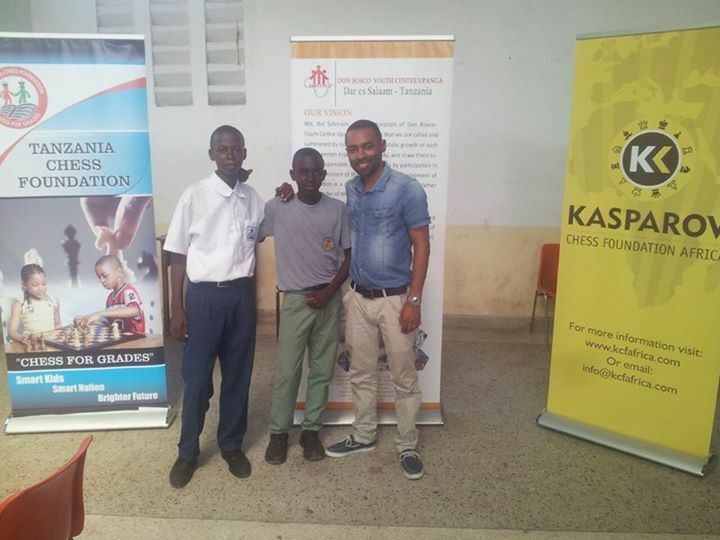 The Tanzania Chess Foundation was proud to host him as the official program partner in Tanzania. 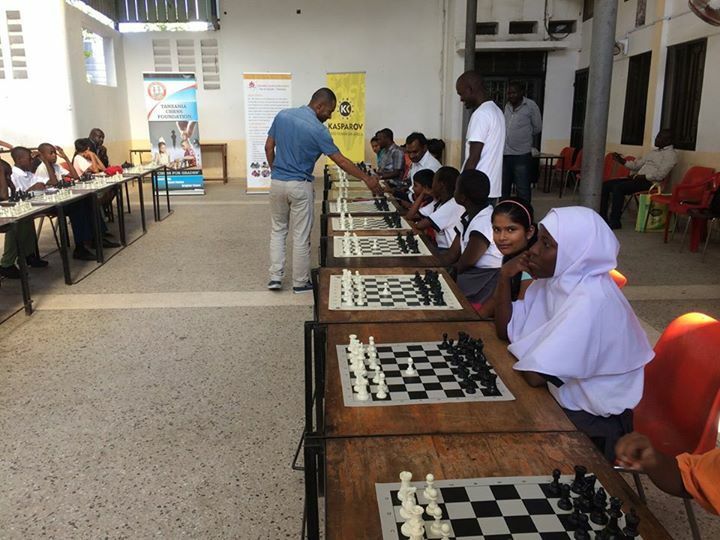 On Friday 24th February 2017 at 15:30 hrs the program was declared open by the Chairman of the Tanzania Chess Association Eng. 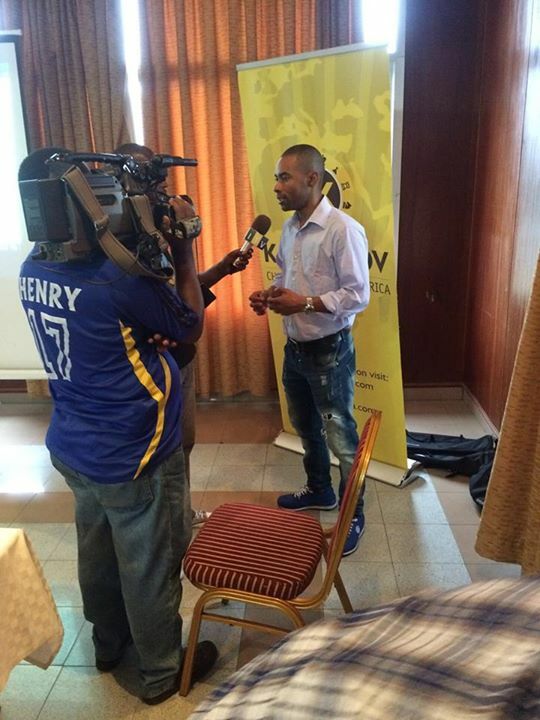 Geoffrey Mwanyika. 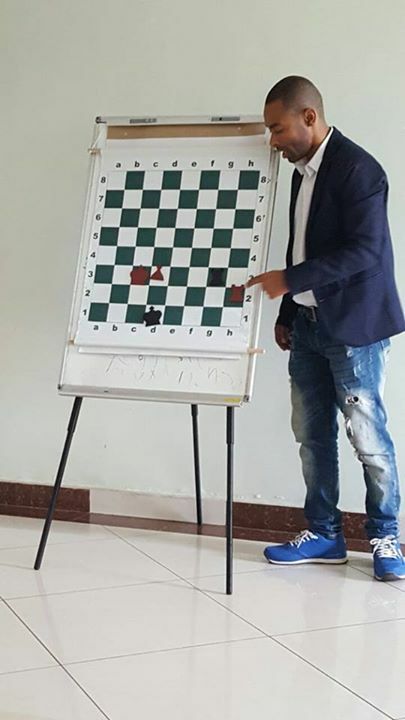 He then made the ceremonial first move as GM Solomon conducted a simultaneous exhibition match with 23 players - most of them under 16 youth from different schools at Don Bosco Youth Centre, Upanga. The event took around 2 hours with Kenny recording a perfect score! 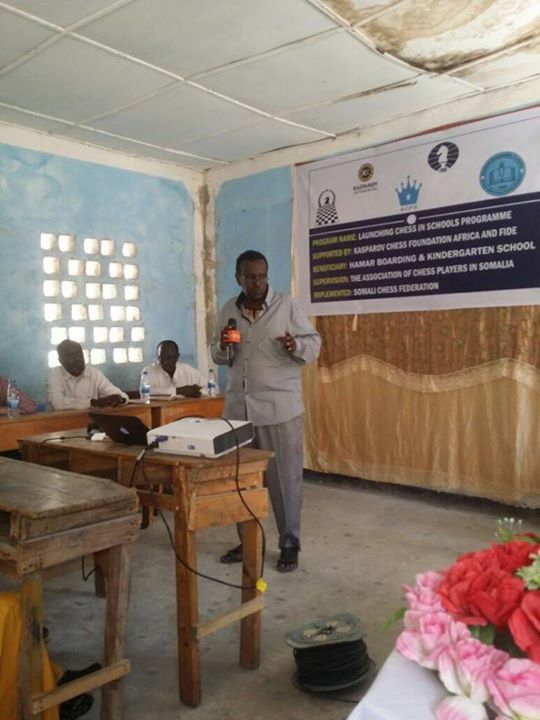 He then also provided a short lecture to the participants on how to improve their game. 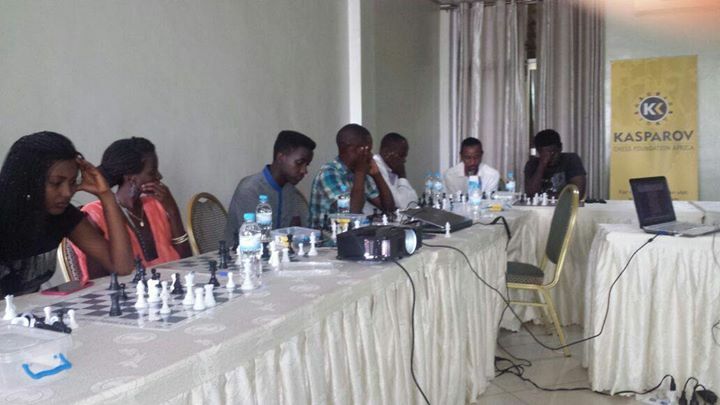 On Saturday 25th February, the 12 registered trainees started their first session of the Chess Master for Africa tour. On the first day GM Solomon covered Rook Endgames, How to play with 2 Bishops, Energetic play (Play with initiative) and emphasized the importance of studying the Classic games of the great's like Steinitz, Capablanca, Lasker, and Tal. On Sunday 26th February 2017, 30 youth from different school attended Kenny's lecture which was based around Pawn end-games. 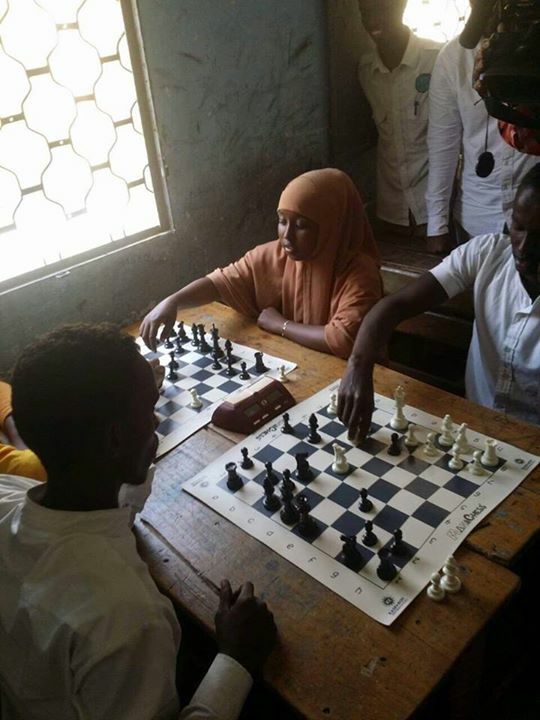 He again emphasized to them how important it was to read books and study chess on a regular basis as this is the only way to improve a play. 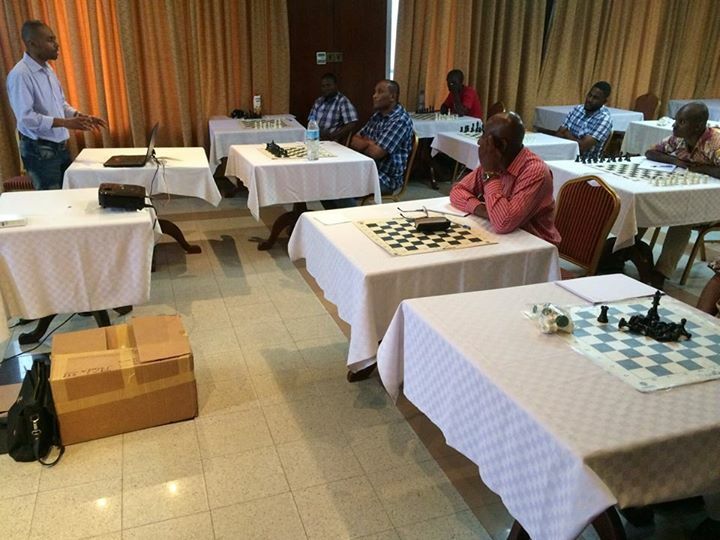 “Chess is a subject ….you have to study “ was a memorable quote by GM Solomon. On the morning of Monday 27th February 2017 GM Solomon continued the trainee training with focusing on Combinations, Tactical Play, and positional understanding (How to access the position). 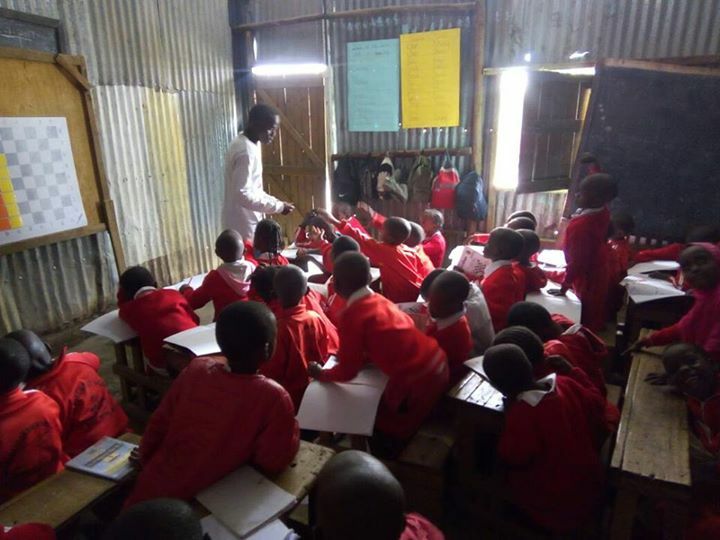 In the afternoon we visited Zanaki Primary School along with the trainees. 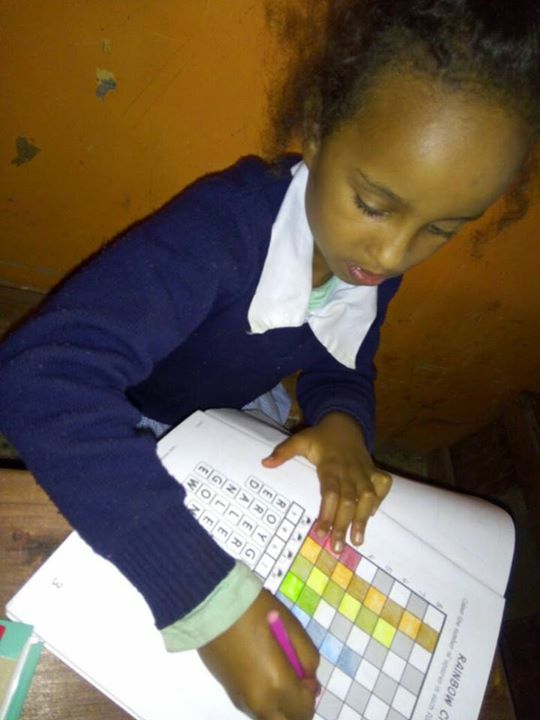 Sets, clocks and a demonstration board were donated to the Head Master and the trainees delivered lessons to 30 students in small group sessions. 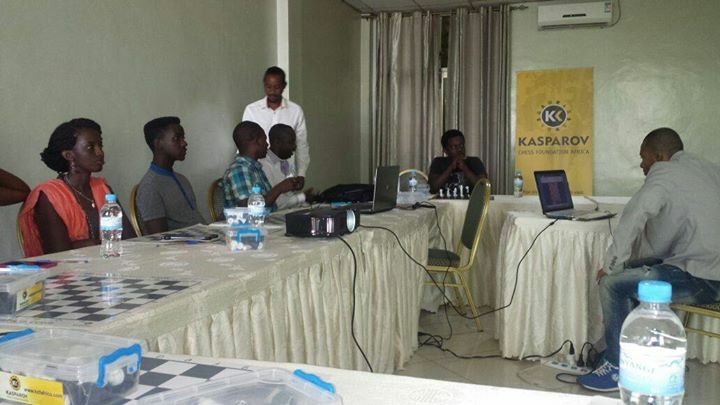 On Tuesday 28th February 2017, the training focused on how to use the Chessbase software correctly, how to prepare against opponents, and how to generate opening ideas and build a repertoire. 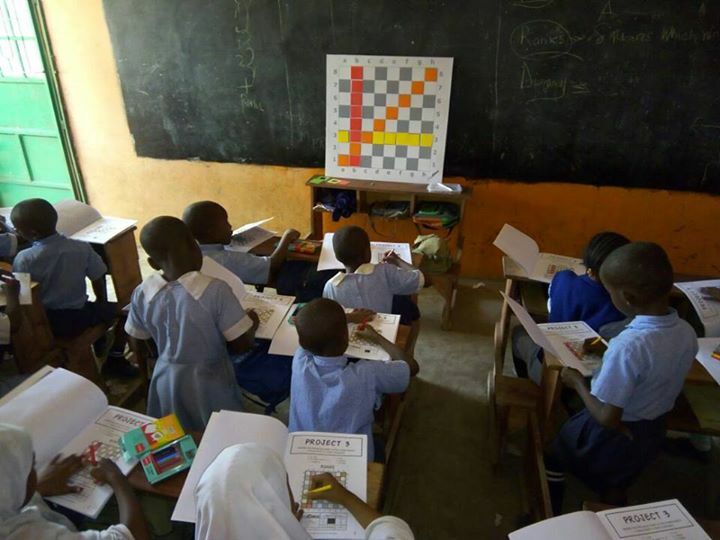 In the afternoon we distributed the allocated chess sets, clocks and demonstration boards to the various trainers who are currently running local academies in Mbeya, Morogoro, Zanzibar and Dar es Salaam. Wednesday was the final day of the tour and was used to conduct one on one sessions (40 minutes) with each trainee. 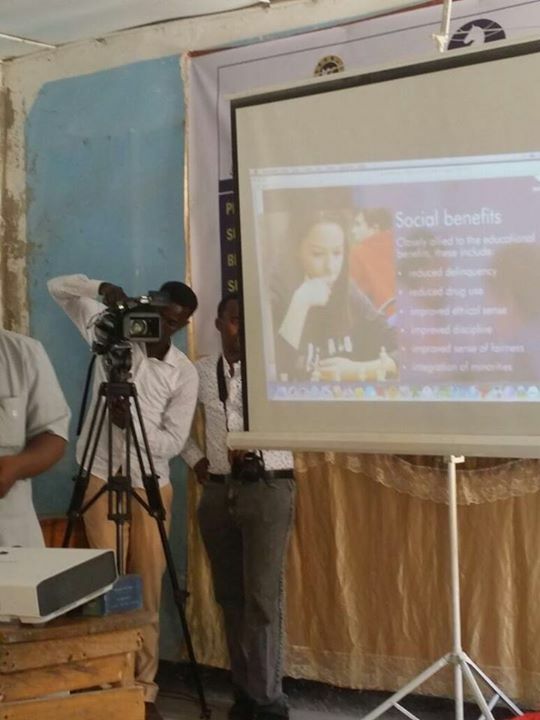 During these sessions, each trainee received recommendations for further study including books and video allocations. 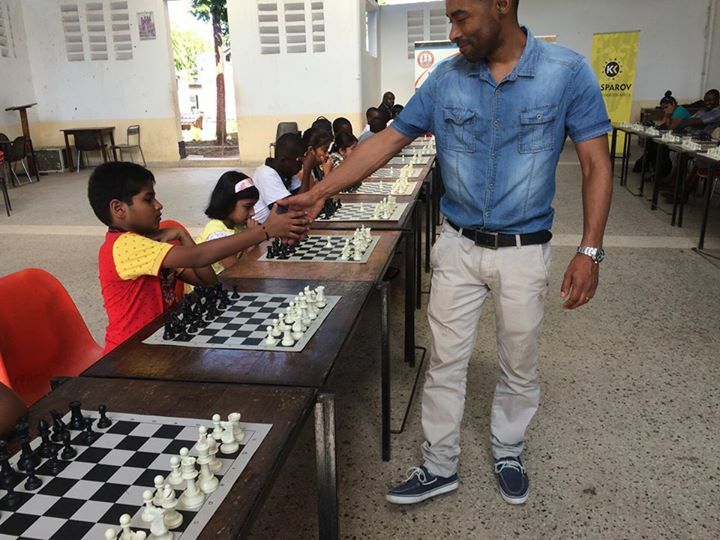 We wish to thank Kenny for the incredible contribution he has made to the development of chess in Tanzania and we hope to see him back in the country in the near future! 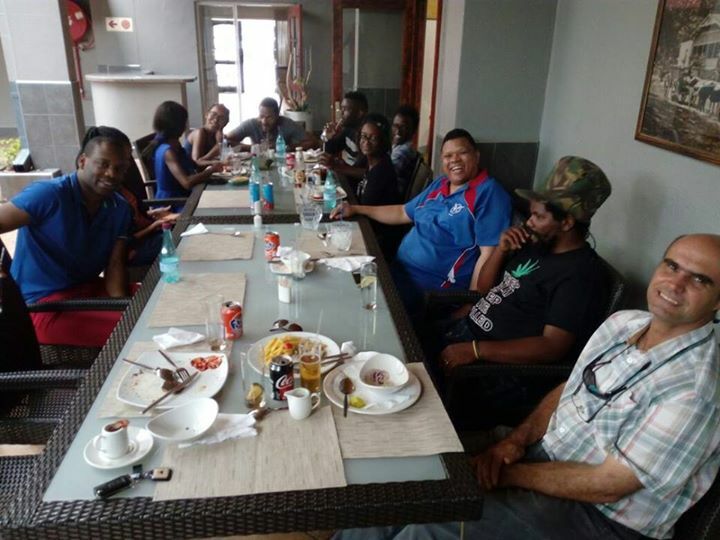 We wish to thank CM Charles Eichab for submitting this comprehensive report from Namibia where GM Pontus Carlsson completed the second leg of his tour last week! 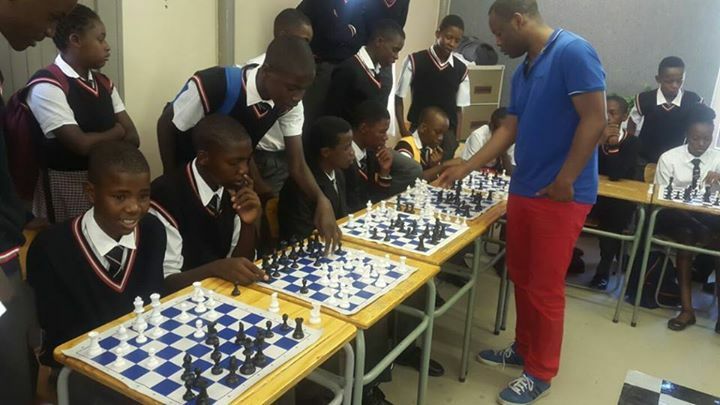 Namibia has historically faced a perennial problem when attempting to grow our membership and make chess more accessible to the ordinary man on the street. 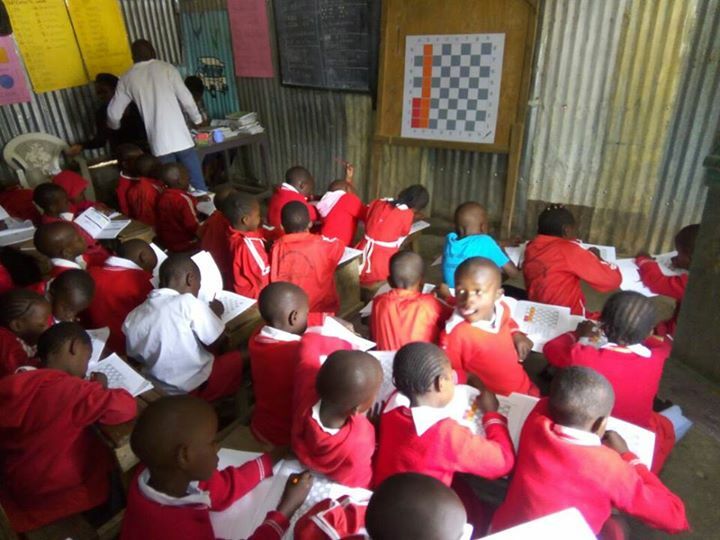 The country is sparsely populated and we encounter problems in many areas of social development from which the game of chess has not been spared. 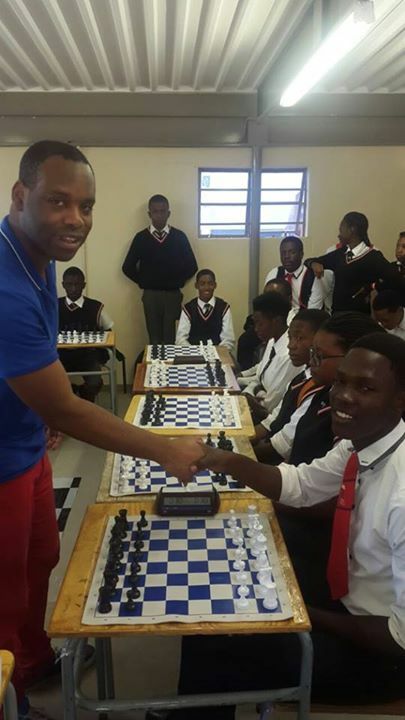 The chess project that has been sponsored by the Paul Allen Foundation and Kasparov Chess Foundation Africa have assisted to fill the void and has every potential to create a great multiplier effect. 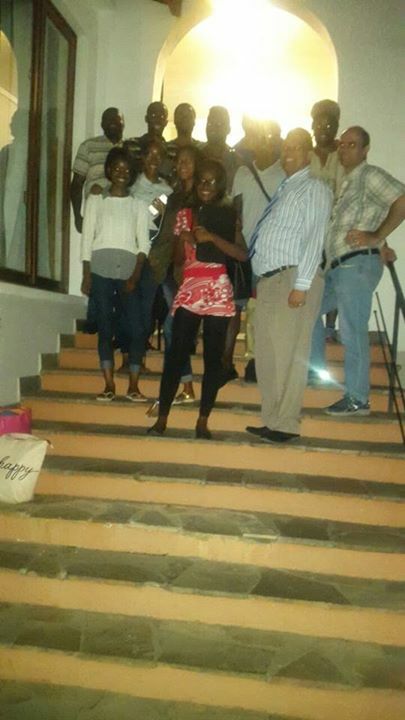 Namibia is a not accustomed to high level chess visits especially by Grandmasters. 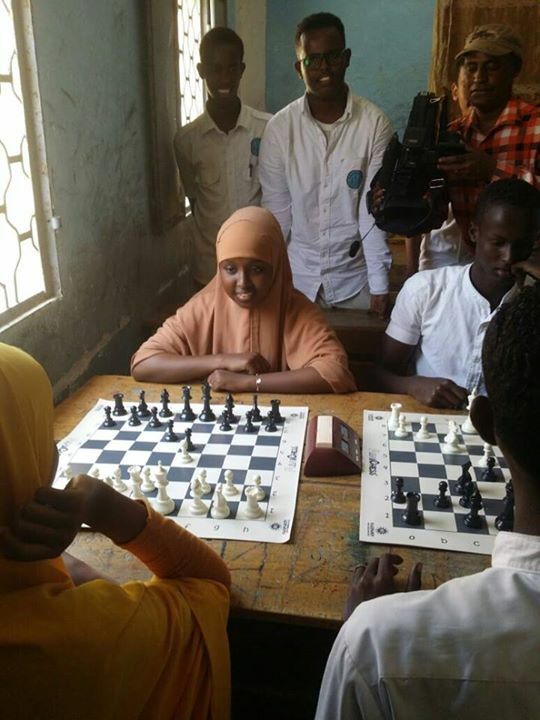 As a country, we thirst for such high level chess training and GM Carlsson’s visit could thus not have been more apt. 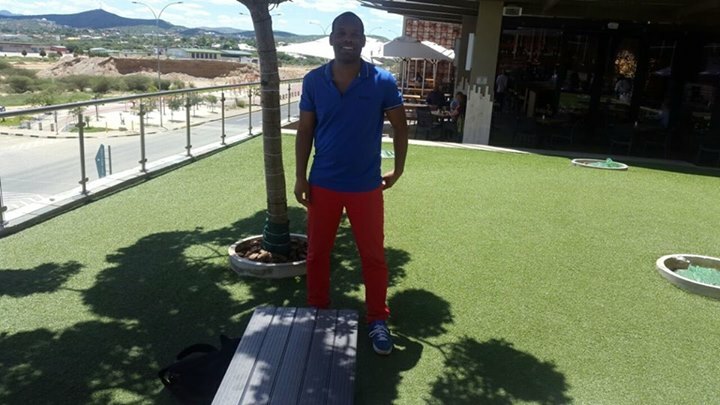 GM Pontus arrived in Namibia on the afternoon of Thursday 16 February 2017 and was received at the Hosea Kutako Airport some 40kms to the east of Windhoek. He was taken to his hotel with the evening spent acclimatizing. 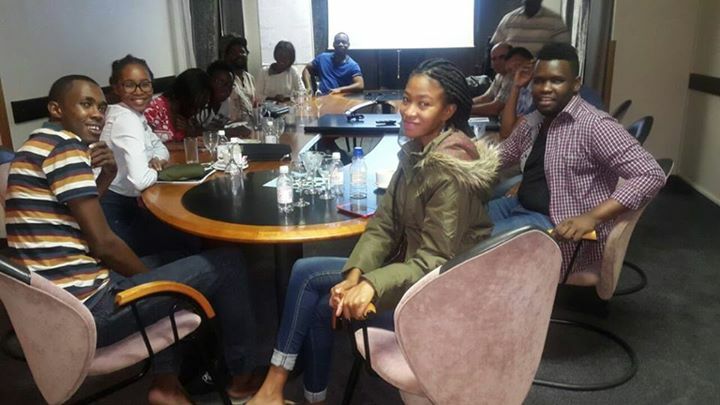 The formal program started early in the morning with a visit to the Namibian Broadcasting Corporation (NBC) which is the leading broadcaster in Namibia. 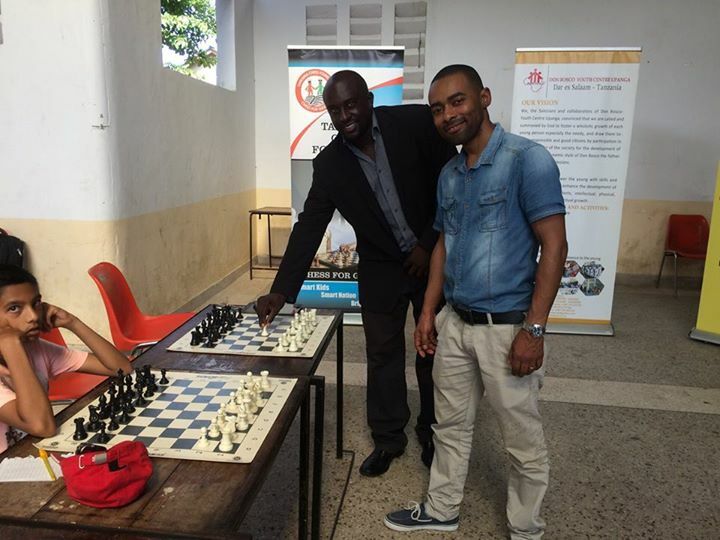 The Grandmaster was hosted on the breakfast show where he explained the aims and objectives of his visits and of the program in general. 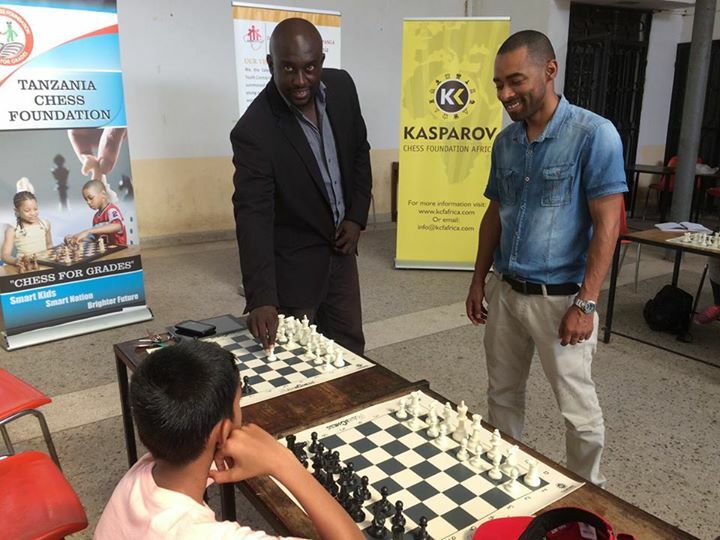 In the afternoon, he competed in a Simultaneous Exhibition against National Team players, National Junior Players, ordinary members of society, school children, club players and passer’s by. 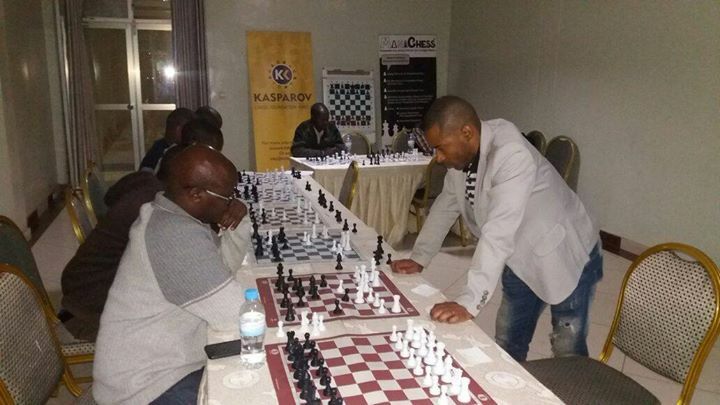 The GM won all his games except for draws against Goodwill Khoa and Namibian National Champion CM Charles Eichab. 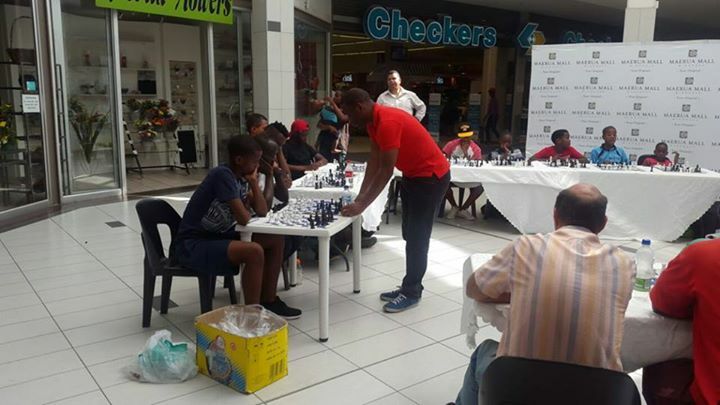 The exhibition proved to be a great event which managed to market chess both to the public and to local corporates. 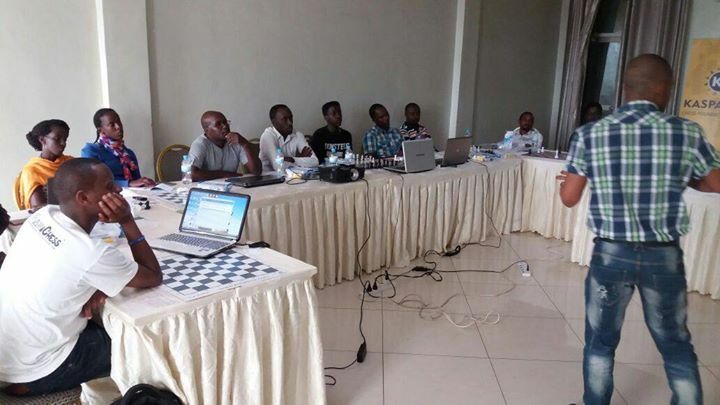 The 12 selected trainees convened for their first training session. 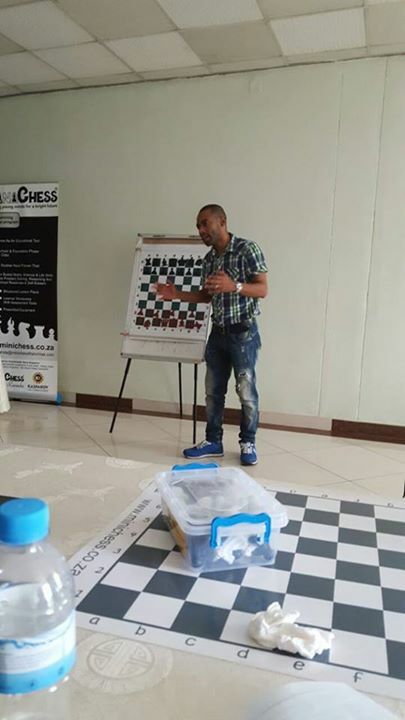 The GM explained that he has divided the training into 3 components: Opening, Middle Game and Endgames and demonstrated how to approach each of the 3 phases as well as the methodologies of teaching them. After 3-hours we had lunch followed by a brief class session and them theme blitz on a selected opening as shown in classes. The GM carefully analyzed the games and addressed our shortcomings and deficiencies. It was highly instructive stuff. 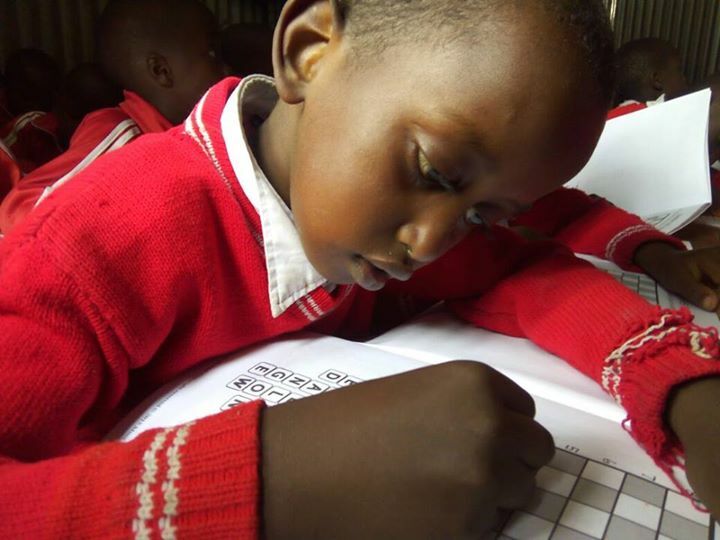 Training continued with opening themes and tactics after time spent reviewing the homework from the previous day. After a break, we started middle game theory and play-outs with some themed middle game positions. 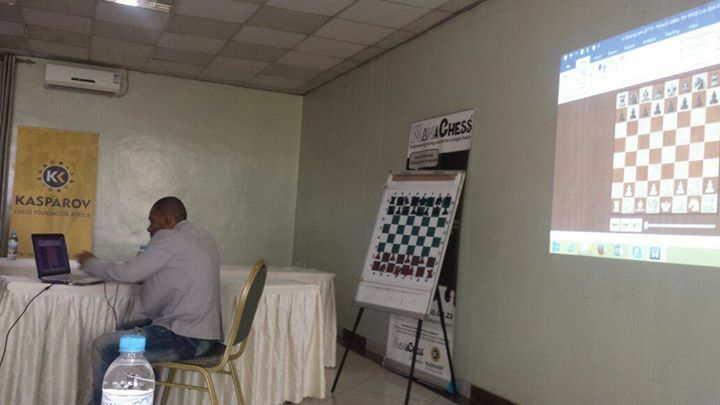 The trainees were asked to download Chessbase 14 and were required to explore and navigate the program and prepare for a virtual opponent. 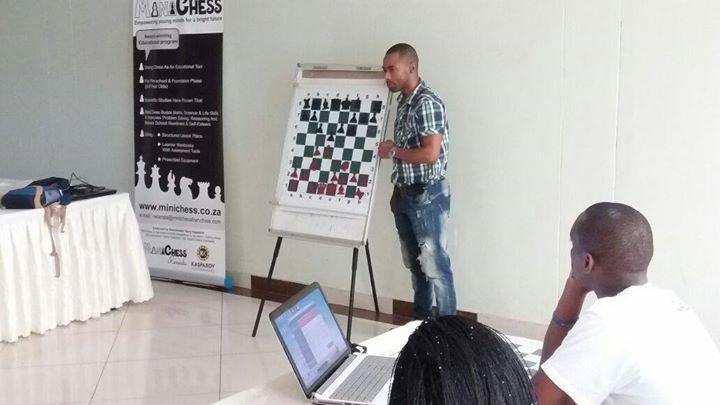 The GM demonstrated how to use Chessbase powerfully and showed various techniques to navigate and prepare against opponents. He also showed end-game theory. Trainees were given a practical task to prepare for Robert Gwaze. The GM was interested in the quality of the preparation. 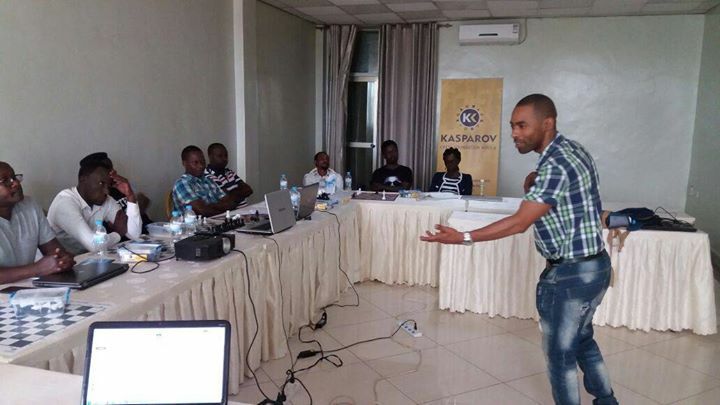 On the 22nd, we went deeper into the process of gaining insights on the opposition using Chessbase data. The training was concluded with endgame theory. 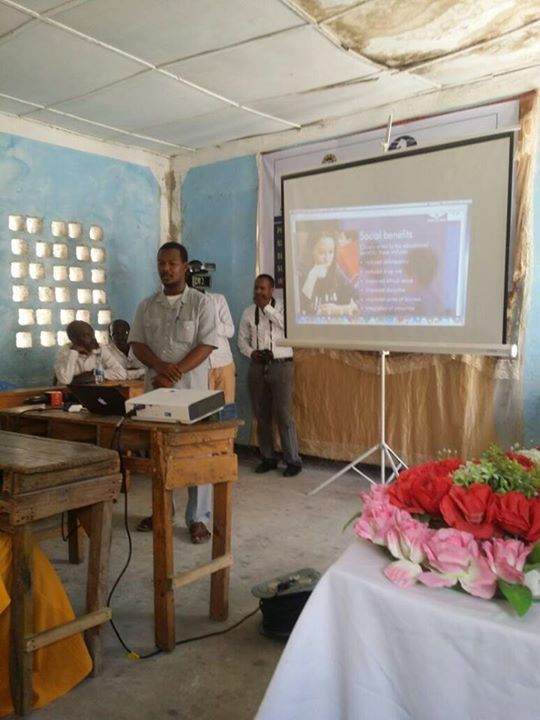 On the final day we staged on school visit for the GM which was a huge success. 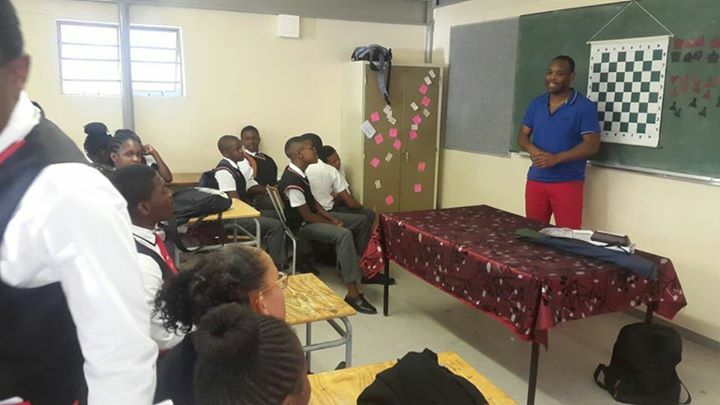 We had a session with 60 learners from the school and spent time with the Principal and the organizing teacher Mr. Mushinga. 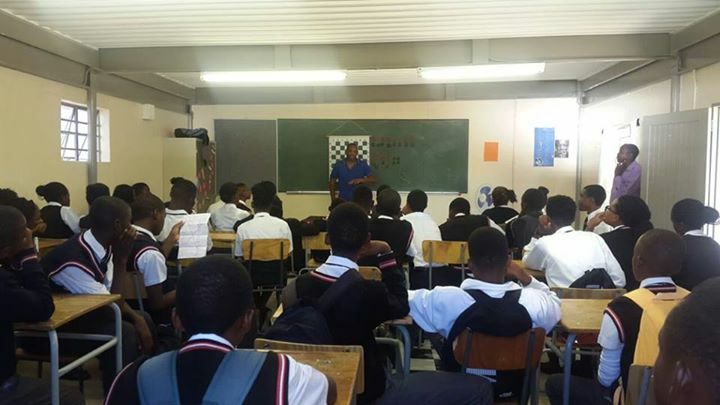 The GM give a motivational briefing to all the learners and conducted a beginner class for all. Afterwards, he took on the top 20 students in a simultaneous exhibition. 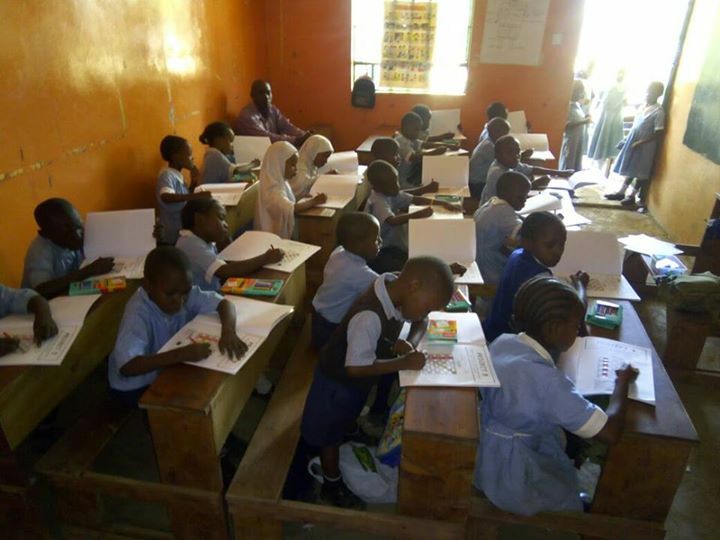 The school trip was a huge success and will soon be in the papers. 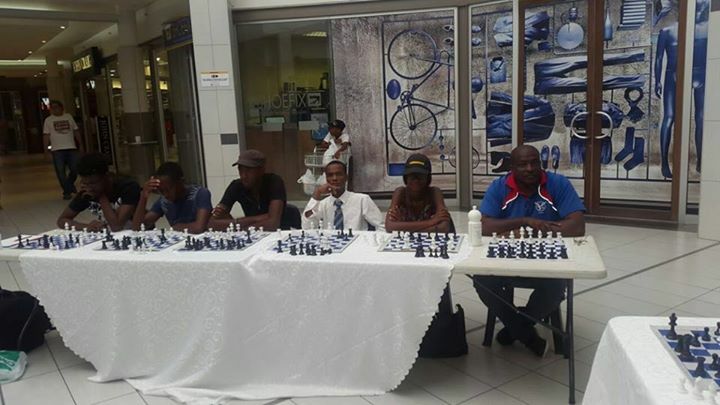 The afternoon was spent at the Mall in Namibia where a lunch was held with members of the Namibia Chess Federation. 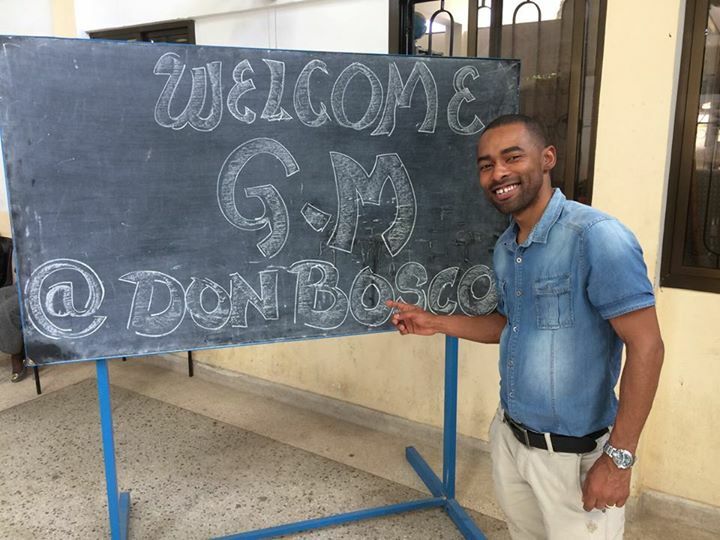 The GM departed for Zambia at 06h50 where he would complete the 3rd and final leg of his tour. The visit of GM Pontus has generated great momentum and left the trainees wanting more. They are eager to continue the course with the next Master. 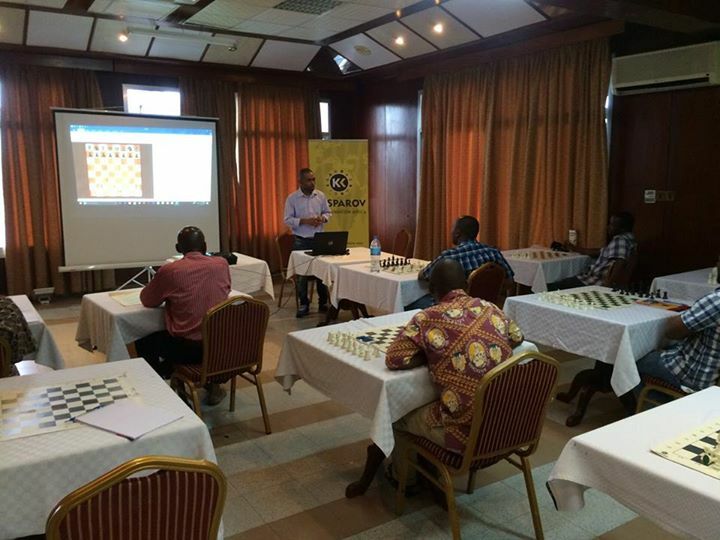 GM Pontus proved to be a top-class teacher with great insight into the intricacies of the game and his ability to execute the course material was excellent. 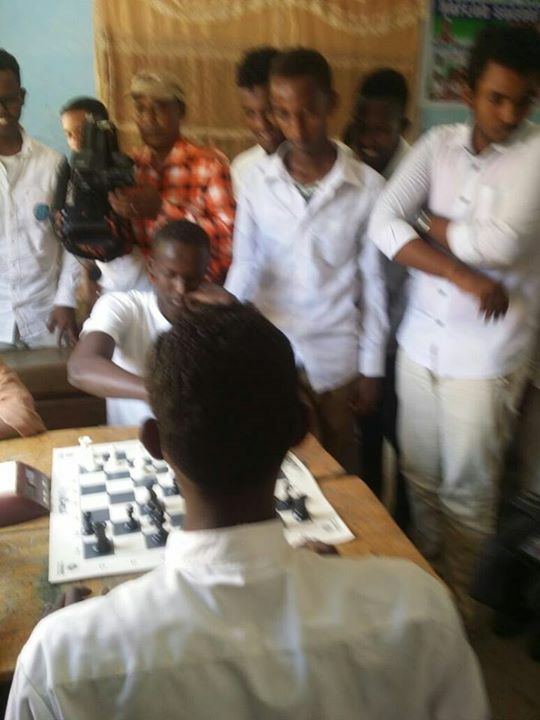 His first day was spent distributing chess material at various schools while in the evening he was interviewed by a local sports channel. 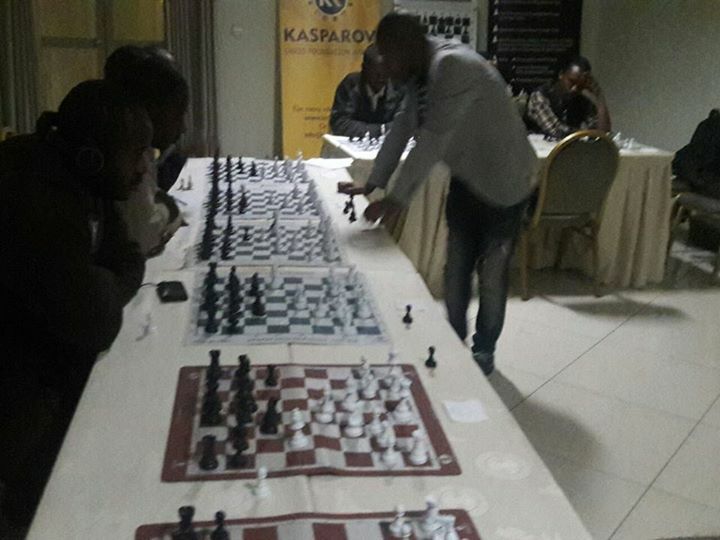 This was followed by a simultaneous exhibition against 9 of the trainees during which he was held to a draw by Eugene Mugema. Saturday morning was spent focusing on rook and pawn endgames while the afternoon sessions handled instructive games.This gave the trainees an appreciation of the strategy and importance of major piece co-ordination. During his talks, Kenny constantly emphasized the importance of knowing the classics. Sunday morning had an energetic start and focused on tactical combinations. 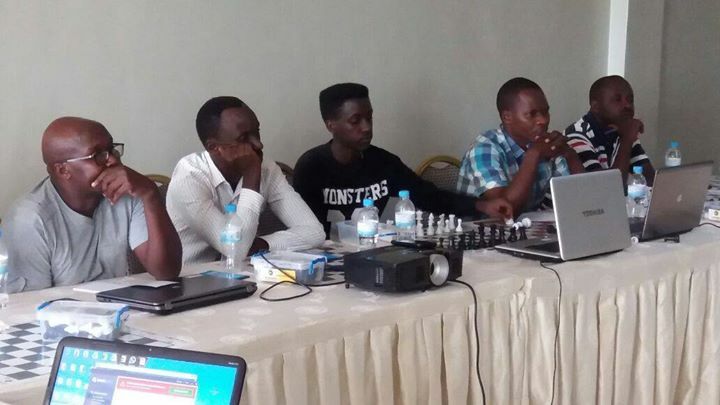 The afternoon session covered themes including the power of the 2 bishops and how to handle more closed positions with space advantages.This was followed by demonstrations on how to use the new Chessbase 14 software and how to download chess games from various chess websites. The next 3 days were spent focusing on individual sessions. In the mornings, Kenny would work through player games and point out common mistakes. He also gave recommendations for improvements during analysis. 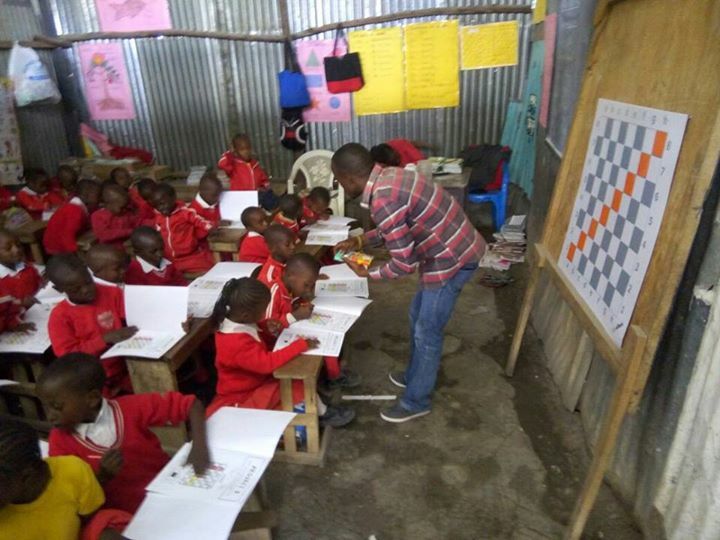 The afternoons involved schools visits where the trainees would each be required to host lesson and teach chess pupils between the ages of 6 and 9. 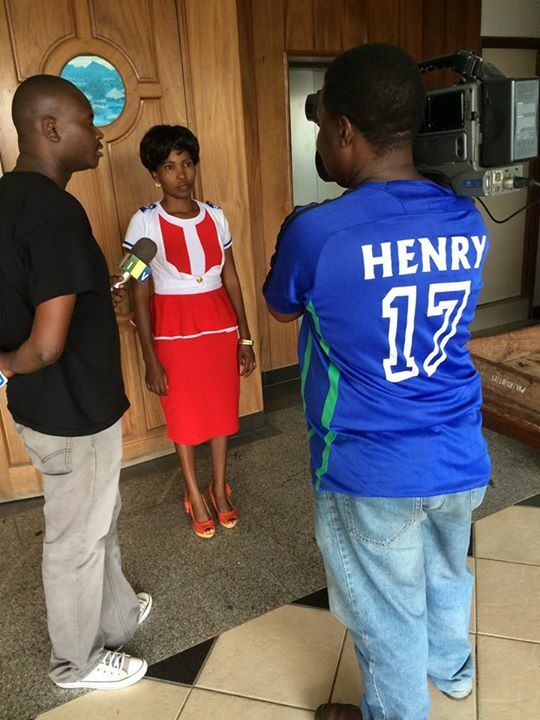 Kenny is now in Tanzania for the final leg of his first trip and we wish to thank him for his tireless efforts! 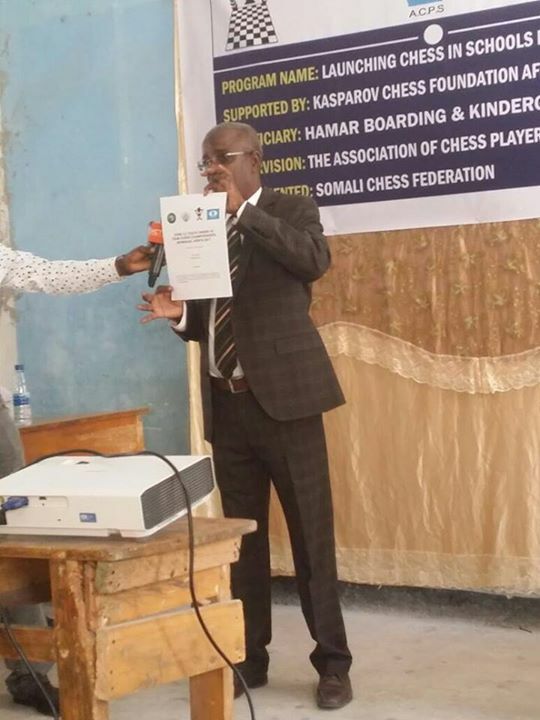 The Association of Chess Players of Somalia and the Somali Chess Federation has started a second program called the Lancing Chess in Schools Program which will benefit the Hamar Boarding & Kindergarten School in Somalia. 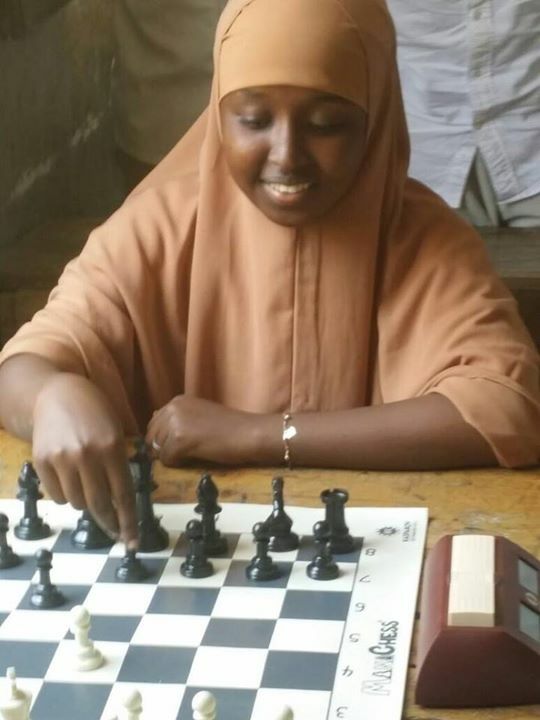 We are pleased to see the equipment donated to the Federation being put to great use and generating significant interest in the game of chess in the country. 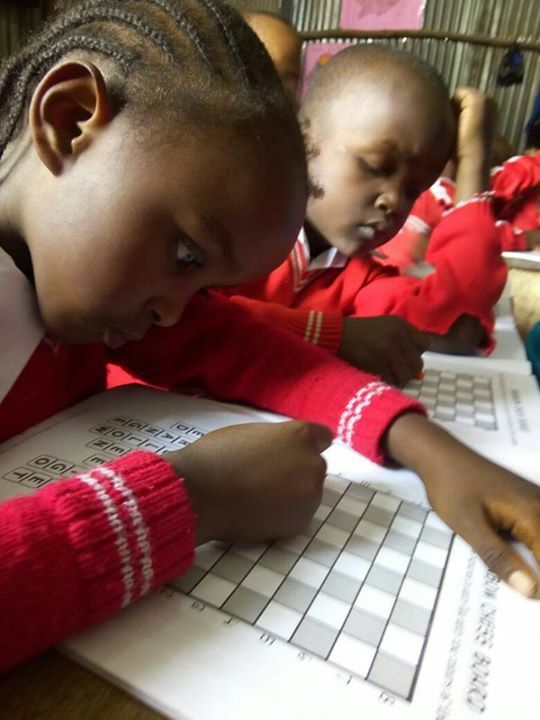 KCF Africa is pleased to announce that our latest program in Kenya is now fully operational and will see 100 learners from three schools benefiting from the MiniChess program in 2017. 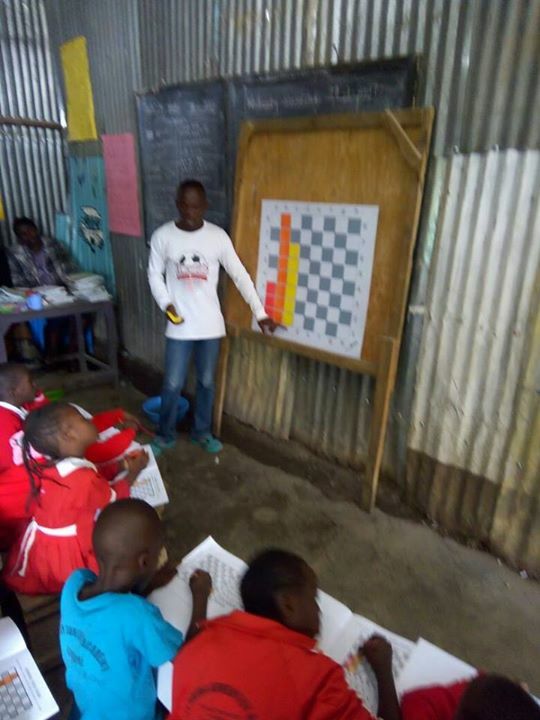 The program is being co-funded with Chess in Schools & Communities from the United Kingdom and is implemented by MiniChess Kenya in collaboration with the Nairobi Chapter of Sports Outreach Ministries. 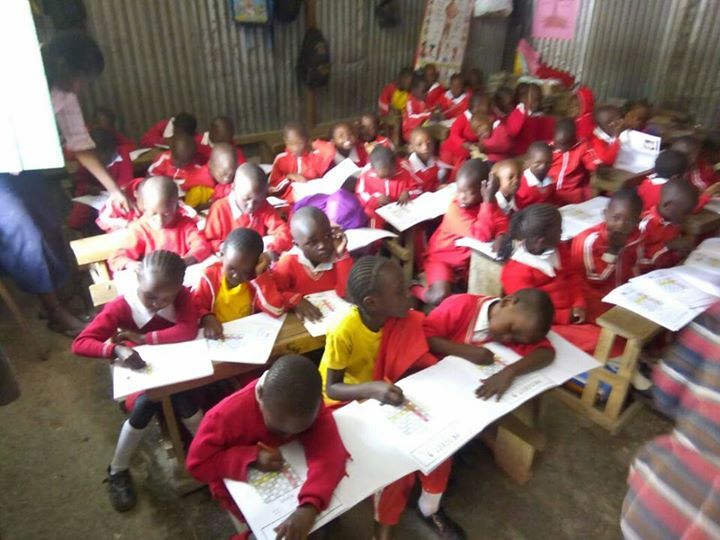 The participating schools are Imara Daima Primary School, High View Classic Academy and the Red Roof Primary School which are all located in Makuru in Nairobi. 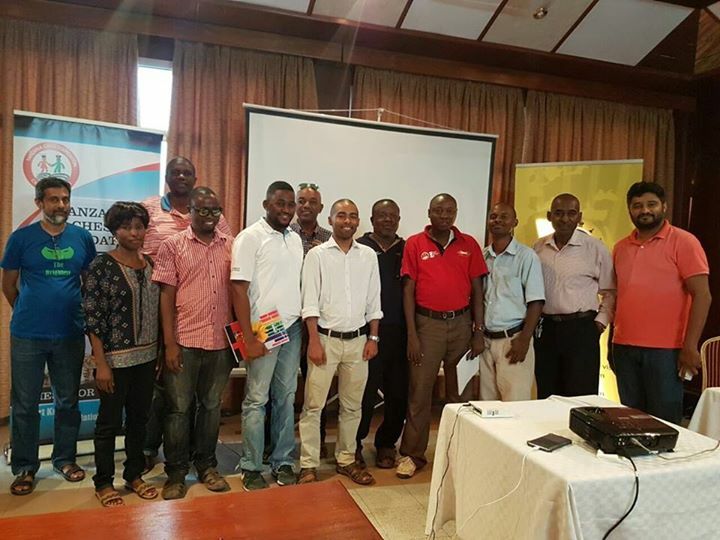 The local trainers are Eric Oyugi and Moses Maina who both recently completed their MiniChess training in Nairobi. 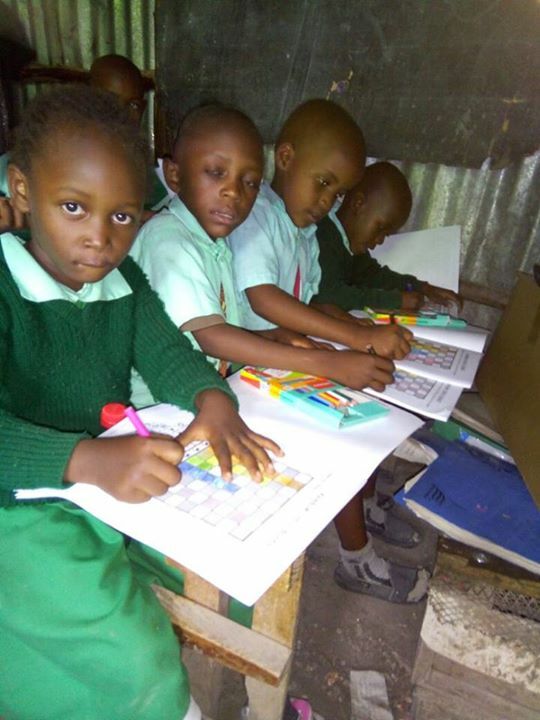 We are excited by the expansion in Kenya as we currently have a number of exciting prospects to further expand the program in the country. 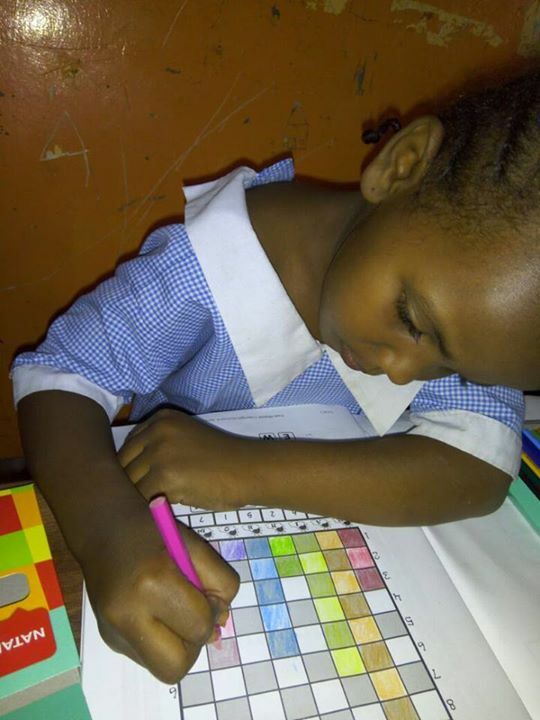 We look forward to seeing further growth in the program over the course of the year. 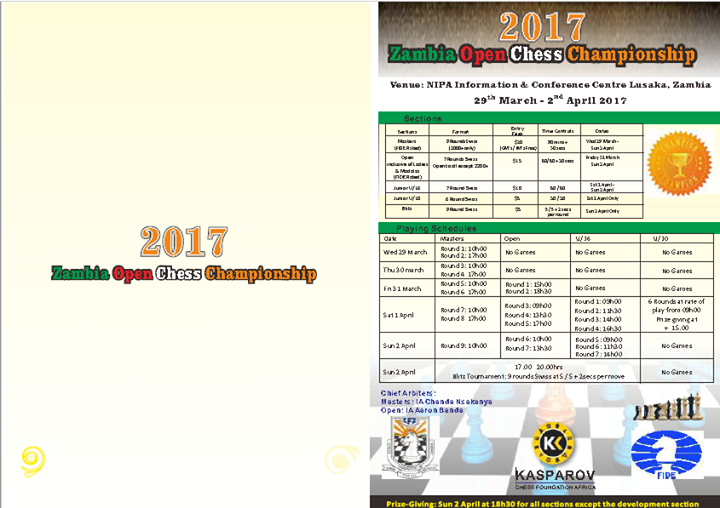 Details of the 2017 Zambian Open have just been released by the Zambian Chess Federation. KCF Africa is pleased to be able to support this flagship event for the first time in 2017 and we look forward to assisting with the revival of the tournament which was last held in 2014. 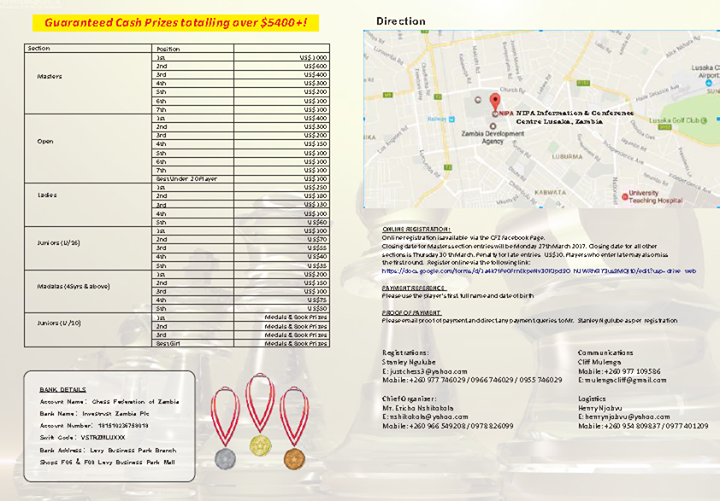 The 2017 Zambian Open will offer a total prize pool of $5400 and consists of a FIDE rated masters event (for players rated 2000+) and an open tournament. 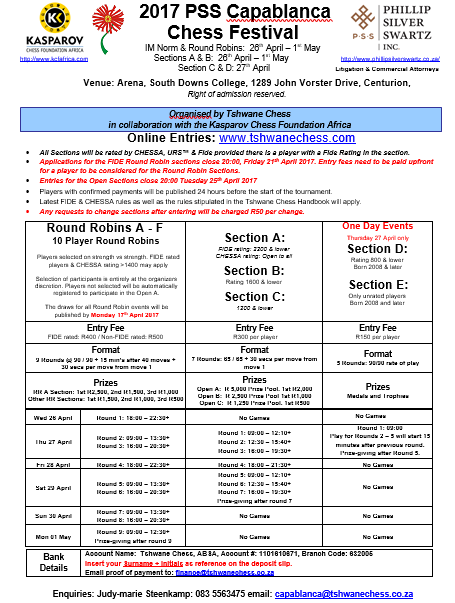 There will also be two junior sections for U/16's and U/10's as well as a FIDE Rated Blitz tournament on the final day. 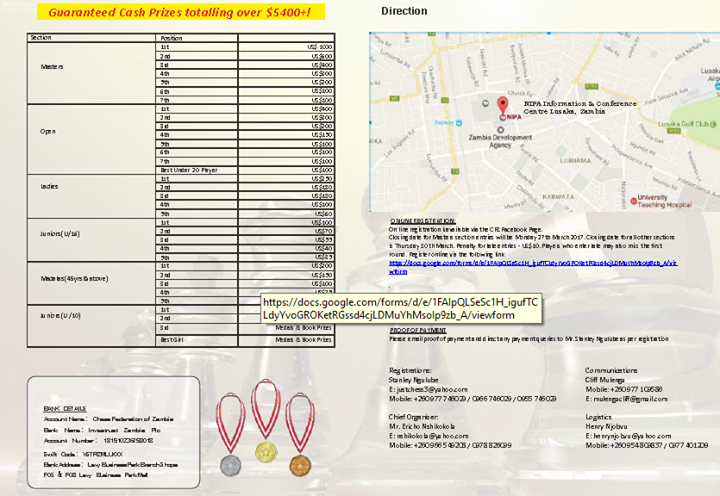 The full event brochure is available for download via the KCF tournament page at http://www.kcfafrica.com/sites/default/files/2017ZA~1.PDF. 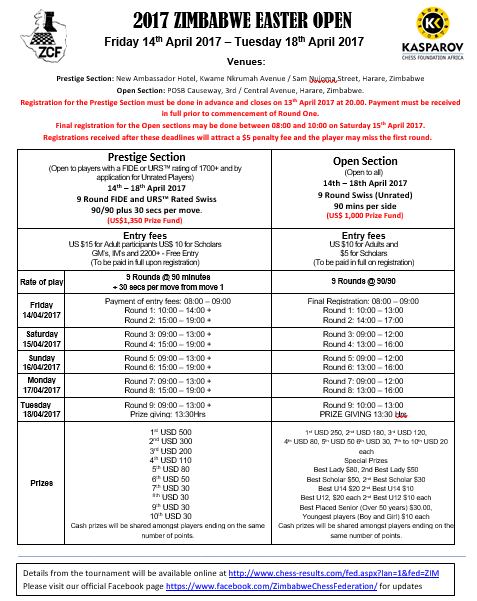 Brochures for our forthcoming April tournaments including the Capablanca Open, PSS Open, Steinitz Open and Zimbabwe Easter Open will be released shortly.